Face Value: Perfectly effective. This cover, for me, strikes the ideal balance of original Nancy Drew nostalgia and serious-looking nonfiction aesthetics. This is a book that I found on a shelf, not knowing anything about it, and bought partially because I was interested but largely because I found it so aesthetically appealing. Interestingly though, as much as I like it, I think that the cover of this book, as well as the content led to some mishelving at my local bookseller. I am pretty confident that this book is intended for adult readers, with older YA appeal. It’s 350 pages with tiny print, and photos only in the middle section. And yet it was placed in with the middle grade collection. I’d be curious to hear from librarians as to where they place it and who they send it out to. Does it Break the Slate? Without. A. Doubt. Brianna’s already talked about Nancy Drew and her Slatebreaking qualities, but it’s exciting to see the inherent feminism behind her creation. Sure, the two women primarily responsible for creating Nancy had different visions for her, but both of them envisioned her as the kind of young woman who they wanted to be – one who took the world into her own hands and solved her own problems and those surrounding her. Who would we give it to? This is an impeccably researched, well-told nonfiction narrative. So I would give it to pretty much any adult or teenager who liked Nancy Drew as a younger girl. If you already have an interest in the subject matter, you’re going to enjoy reading Rehak’s account of Mildred Augustine Wirt and Harriet Stratemeyer Adams and how they created Nancy and her world. It’s worth noting that only women responded, but those that did varied in age across several decades. Even if she got a little too predictable for you, her icon status is undeniable. I loved Nancy Drew too. And so, when I happened upon this book, I was surprised by how little I actually knew about her, and about how the series came to exist. I was also pleased by how much feminism seemed to have an impact on her development, in the grand scheme of things. 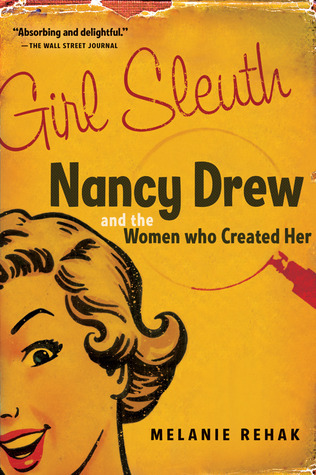 Though Nancy Drew was initially conceived of by a man, Edward Stratemeyer, it was two different women that really brought her to life, Mildred Augustine Wirt and Harriet Stratemeyer Adams. Edward was the creator of the Stratemyer Syndicate, which also created popular children’s books like The Hardy Boys, and The Bobbsey Twins. Essentially the syndicate would create a concept for a series, make up a fake author’s name and send short “pitches” for the different books to a crop of ghostwriters, who would send them back. That way the syndicate had a tremendous amount of control over, not only the content they published, but the brand. If an author moved on to other things (or started to ask for too much money, in some cases) another writer could take over without any loss of allure or audience. When Edward came up with the concept for Nancy Drew (who was originally going to be named Stella, which would have obviously been awful), he gave the first pitches to a young writer named Mildred Augustine . She demonstrated a remarkable skill for both the style of writing and for capturing Nancy’s voice. She wrote many of the early Nancy Drews. When Edward died, his daughter Harriet Stratemeyer Adams took over the syndicate. She wrote many of Nancy’s later stories after Mildred stopped working with the company. Rehak gives us a terrific sense of the way these two women shaped Nancy’s character and her world – and the way Nancy shaped each of their lives and careers. Both Mildred and Harriet are without a doubt real life Slatebreakers, constantly shattering the expectations other people might have for them. Part of what makes this such an engrossing read is just that – both Mildred and Harriet demonstrated the qualities that so many of us wanted Carolyn Keene to possess. Their strength and persistence, their careers at times when women weren’t expected to have them, all reinforce the particular type of pedestal upon which we’ve placed Nancy over the years. Their story is worthy of our fascination, and worthy of the mythology they created. This entry was posted in All Stars, Reviews, Theme Week, Young Adult and tagged Carolyn Keene, Detectives Week, Feminism, Girl Detectives, Nancy Drew, Nonfiction. Bookmark the permalink.